Steve DiPaola is an active artist and scientist who explores AI, cognitive science, virtuality and creativity systems both in his research and art work. View his resume (most updated). Using Cognitive Science as a basis for our work, we attempt to model aspects of human creativity in AI. Specially we are using Neural Networks (and evolutionary systems) in the form of Deep Learning, CNNs, RNNs and other modern techniques to model aspects of human expression and creativity. We are known for modelling expression semantics and generation of visual art (stills, videos, VR) but have extended our work into expressive forms of linguistic (word based) narrative. Our lab has extensive experience in using different sensing technology including eye tracking and facial emotion recognition (DiPaola et al 2013), as well as gesture tracking and bio sensing heart rate and EDA (Song & DiPaola, 2015) which both affect the generative system and can be used to understand the reception to the generated graphics (still, video, VR). Our open source toolkit / cognitive research in AI 3D Virtual Human (embodied IVA : Intelligence Virtual Agents) - a real-time system that can respond emotionally (voice, facial animation, gesture, etc) to a user in front of it via a host of gestural, motion and bio- sensor systems. The system uses SmartBody (USC) and MatLab Simulink as its control and AI system. What is abstraction? Can you use AI techniques to model the semantics of an idea, object, or entity, where that understanding allows for abstraction of the meaning? We use several AI techniques including genetic programming, Neural Nets and Deep Learning to explore abstraction in its many forms. Mainly here in the visual and narrative arts. This research uses creative evolutionary systems to explore computer creativity for various applications: in our first pass - evolving a family of abstract portrait panter programs. Can you build a computer parameterized model of the cognitive process or open methodology that human portrait painters use. 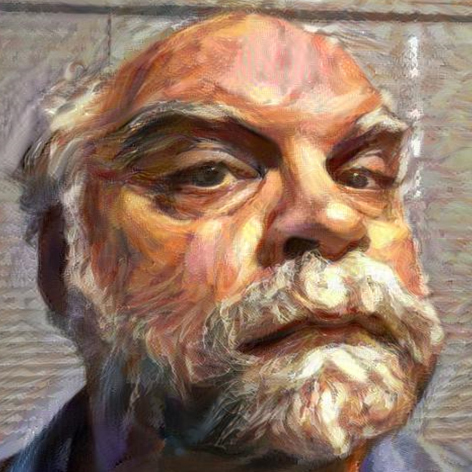 This interdisciplinary toolkit research project automatically generates painterly output from people photographs and cognitive parameters. A system for creating, animating and communicating with 3D faces types. This dev toolkit is based on a hierarchical parametric approach allowing for an additive realtime language of expressions, emotions and lip-sync sequences.. Introducing the concept of Face Multimedia Object (FMO), iFACE develops an integrated framework for working with FMO by defining and implementing the necessary functionality (3D and 2D) and exposing proper interfaces to a variety of application types (Web clients, GUI programs, and interactive users). An interactive beluga whale pod simulation for the Vancouver Aquarium which uses realistic 3D graphics and an artificial intelligent system. It was informed by research data from the live belugas. The goal of this project is to deliver a rich experience of human socialization and telepresence via a voice-enabled web3D avatar community by emulating natural socal metaphors. Music-driven Emotionally Expressive Face (MusicFace) creates 'facial choreography' driven by musical input. Structural and emotion data are extracted from the music via a fuzzy rule based system and remapped to 'equivelents' in face space. Researching how mathematicians (& scientists) using 3D v-environments can collaborate with each other using 3D with rich media objects (browsers, video, 3D models, animation), avatar embodiments and spatial user interface constructs. An interactive 3D knowledge visualization system that explores a more intuitive approach to knowledge and data visualization. An open source, cross platform programming project using openGL, Python and XML. Now working with Connection's James Burke. Using virtual tools, this was an interdisciplinary, cross-institutional effort in collaborative design, distance learning and virtual performance culminating in a co-designed fashion show and performance. genFace uses a genetic algorithm technique to search through a large multi-dimensional space of correlated faces -- making it possible to traverse a path from any face to any other face, morphing through locally similar faces along that path.